Psaki says without foreign funds to prop it up, PA may disband in weeks and cause a 'dire situation,' noting that Congress won't help. 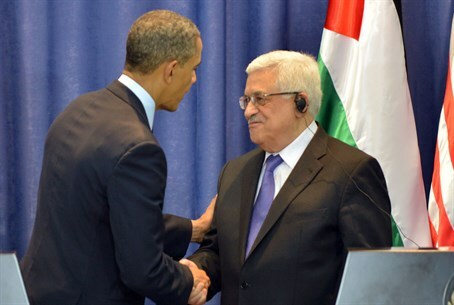 The United States voiced fears Thursday that the Palestinian Authority (PA) may be about to collapse due to a lack of funding, as years of massive debt have piled up, Israel withholds taxes in response to unilateral PA breaches, and donor aid stalls. Washington has been in urgent talks with regional leaders as well as other stakeholders in the frozen Middle East peace process in a bid to try to release more funds, reports AFP. "It's true we're very concerned about the continued viability of the Palestinian Authority if they do not receive funds soon," State Department spokeswoman Jen Psaki told reporters. Psaki made clear those funds include the resumption of Israel transferring taxes it collects for the PA as per the 1993 Oslo Accords. In January, Israel suspended $127 million in tax revenues as a response to the PA joining the International Criminal Court (ICC) to sue Israel for "war crimes," in a unilateral move breaching the Oslo Accords which formed the PA. The PA membership in the ICC, which takes effect on April 1, is meant to allege that Israel committed war crimes during Hamas's most recent terror war, but many note it can backfire as it opens the PA and Hamas up to war crimes suits. PA chairman Mahmoud Abbas's Fatah faction boasted of firing rockets at Israel during the war, with each rocket on civilian centers constituting a war crime. Aside from the tax issue, donors have failed to make good on $5.4 billion promised at a Cairo conference in October to help rebuild the Hamas terror stronghold of Gaza after last year's 50-day war. The IMF reported last month that the war between Israel and Gaza drove the Arab economies of Gaza, Judea and Samaria into their first contraction since 2006. Psaki warned that if the PA ceased security cooperation with Israel "or even decides to disband, as they have said they may do as early as the first week of March," it could trigger a dire situation. "We could be faced with a crisis that could gravely impact both the Palestinians and the Israelis, with potentially serious ripple effects," she said. US officials have been in talks with counterparts from the EU, UN, Russia and the Arab League to discuss the situation. US Secretary of State John Kerry met Thursday with the head of the Arab League, Nabil al-Arabi, praising him as a "solid partner" in many issues including the Middle East peace process. Peace talks have stalled since Kerry's bid for a treaty collapsed spectacularly last April, when the PA torpedoed talks by forming a unity deal with the Hamas terrorist organization. Psaki acknowledged that given the recent Republican victory in mid-term elections and stalled talks, it "would not seem possible to get further assistance to the Palestinian Authority through Congress in the near future." Washington was warning partners "about the importance of stability in the region and the implications that go well beyond security," she added. "Hundreds of thousands of students could be without teachers, hospitals could cease to function. ...The cost to both Palestinians and Israelis could be immense in both financial and human terms," she opined.